Note that our submission system has recently changed. If you plan to submit to Nano Energy, please click on the Submit your Paper link to be taken to the correct submission system. Please do not use saved/bookmarked links. 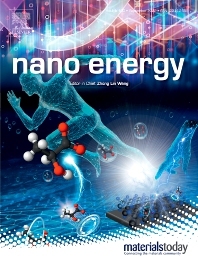 Nano Energy is a multidisciplinary, rapid-publication forum of original peer-reviewed contributions on the science and engineering of nanomaterials and nanodevices used in all forms of energy harvesting, conversion, storage, utilization and policy. Through its mixture of articles, reviews, communications, research news, and information on key developments, Nano Energy provides a comprehensive coverage of this exciting and dynamic field which joins nanoscience and nanotechnology with energy science. The journal is relevant to all those who are interested in nanomaterials solutions to the energy problem. Nano Energy publishes original experimental and theoretical research on all aspects of energy-related research which utilizes nanomaterials and nanotechnology. Manuscripts of four types are considered: review articles which inform readers of the latest research and advances in energy science; rapid communications which feature exciting research breakthroughs in the field; full-length articles which report comprehensive research developments; and news and opinions which comment on topical issues or express views on the developments in related fields.